I've always like fresh cut flowers, have always wanted to have them in the house but do not have the opportunity till now. Daddy bought our 1st bouquet of flowers for the dinning table last week, I thought why not keep it going? Decided to get some flowers at Thomson Plaza after my chiropractic appointment. 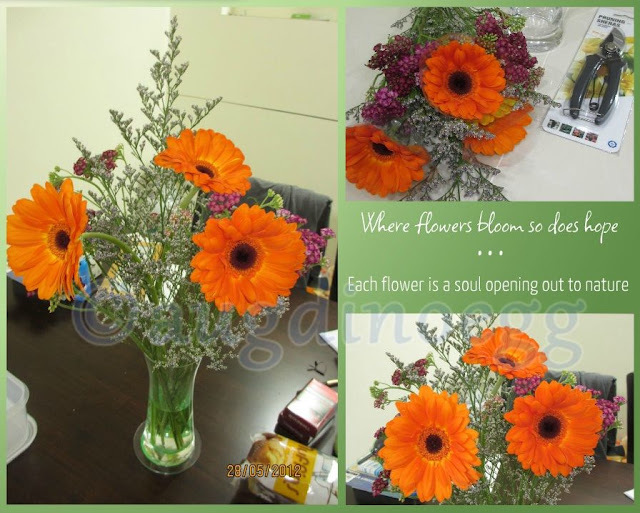 I went to the only florist in the building *spend a bomb* to get 3 gerbera and some other flowers (of names which I do not know). I choose orange coz its very bright and cheerful, the way I like it. I even went to the Home-Fix DIY store next door to get a pair of pruning shears (trying to act pro hahaha), time to do justice to our kitchen scissors. I am still not good at the flower arrangement, who would have thought putting a handful of flowers into a small vase can be so difficult and requires more skill then simply putting them into the vase. I cannot believe how much a stalk can cost so much, will try to look for alternative place at convenient location to buy cheaper flowers to satisfy my flowers "crave". They brighten up the house, dont they? So nice of Mr Loh to start the trend! *ahem* -claiming credits- I was the one who started it in our "old" house but only lasted for a short while :P This house is so comfy n so wonderful that flowers are a MUST! You can try to buy the flowers from the nurseries at Thomson. They are much cheaper then buying them retail at a shopping mall. There is quite a big selection at Far East Flora. I sometimes get my flowers from cold storage too.